After two days of hectic long journey to Nubra valley, fourth day of our ladakh trip was planned to be a leisure trip visiting some attractions near to leh town. So we woke up late in the morning at around 8 AM, had break fast and boarded the cab. Our first stop was at Hall of Fame Museum, setup by the Indian Army in memories of brave soldiers who lost their lives in Indo-pak wars. Hall of fame museum is located beside the leh aiport on the kargil highway. The museum has every thing we needs to know about Ladakh, like Ladakh History, Wars in Ladakh, Army setup in ladakh, vegetation and many more. My favorite being Siachen section which is located in first floor. Siachen section is very interesting, tells you how army is surviving in harsh climatic conditions(-50 degrees), what they will eat, what they will wear(exhibits), how much government is spending per day for maintaining siachen camp, weapons army uses and many more. On the ground floor, there is a sovereign shop and a mini theater. I watched a video related to Kargil war in that mini theater and after watching that, you will definitely feel proud about the Indian army. The war memorial located outside the museum is also good. 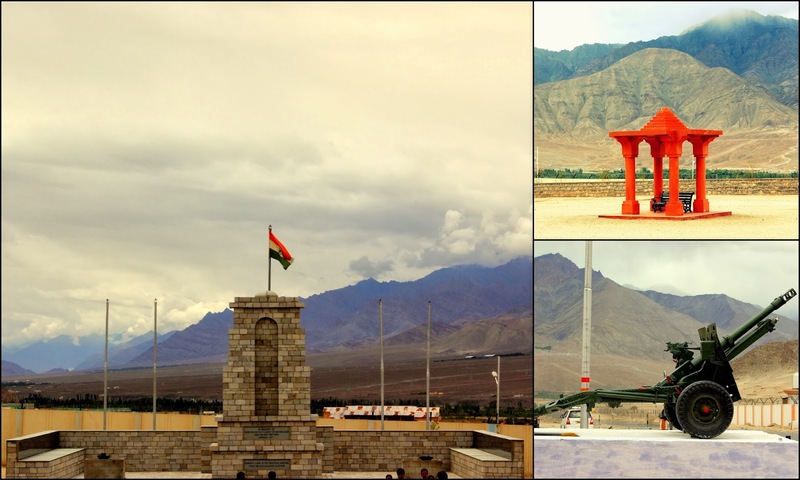 If you are lucky enough, you can spot flight take off from the leh aiport, located besides the war memorial. Our next stop was at Spituk Monastery, which is just 5 minutes away from Hall of fame Museum. 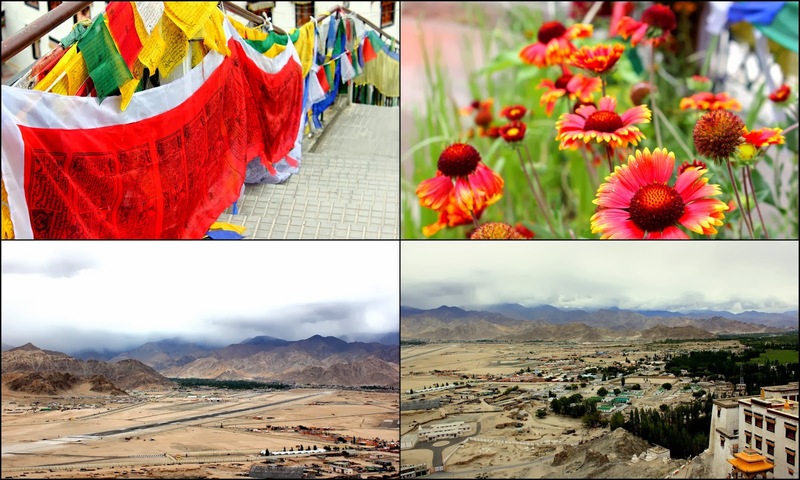 There is nothing much to visit inside the monastery, but the views of leh town, airport and surrounding mountains was awesome. Even though we are not much interested in visiting monasteries, we visited this place to enjoy beautiful landscapes of leh town. After spending 30 minutes in Spituk monastery, we went towards the kargil route to visit sangam. It is around 1 hour journey from Leh town, which is a confluence of Indus and Zanskar rivers. I read about the Indus river when I'm in school and never thought that I will be visiting Indus river in my life. 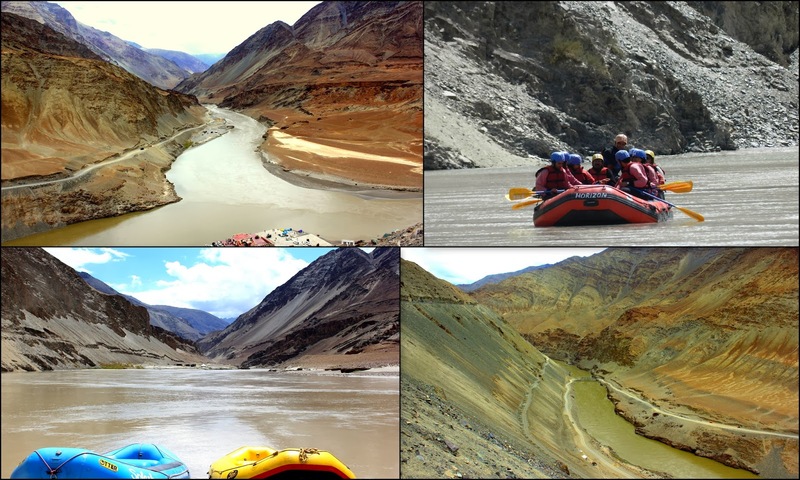 We thought of doing rafting at sangam, but dropped the plan because of lack of time. Grade of rapids was also not higher. If you want higher grade rapids, then you have to travel at-least 2 hours from sangam, but requires more than half day time. After visiting sangam, our driver thought that Alchi and Likir is also included in the plan and took us 10 miles from sangam towards kargil, and then he realized that it was not included and stopped at Nimmu village for lunch. It was a small hotel, serving samosa and rotis, btw food was good. From nimmu we started our journey back to leh. On the way, we stopped at Magnetic hill. For all those who don't about Magnetic hill, this is a gravity hill, where if you place your vehicle with ignition off at a specific place, the vehicle moves up hill with out starting the engine. Before this trip, I watched many videos of magnetic hill and thought that it was not true. But when I actually saw the magnetic effect on our vehicle, I was amazed. We asked our driver to place the vehicle at a specific position and asked him to switch off the ignition. Anil was inside the vehicle watching the driver. The vehicle started climbing the up hill and driver was just handling the steering. We made driver to do it three times to understand the magnetic phenomenon. While we are trying to understand the logic behind magnetic hill, one foreigner with en-field bike stopped near to us. He don't know anything about magnetic hill, when we told him about this phenomenon, he looked at us such a way that we are cheating/making fun of him. But when he tried himself, he realized the effect of magnetic hill. 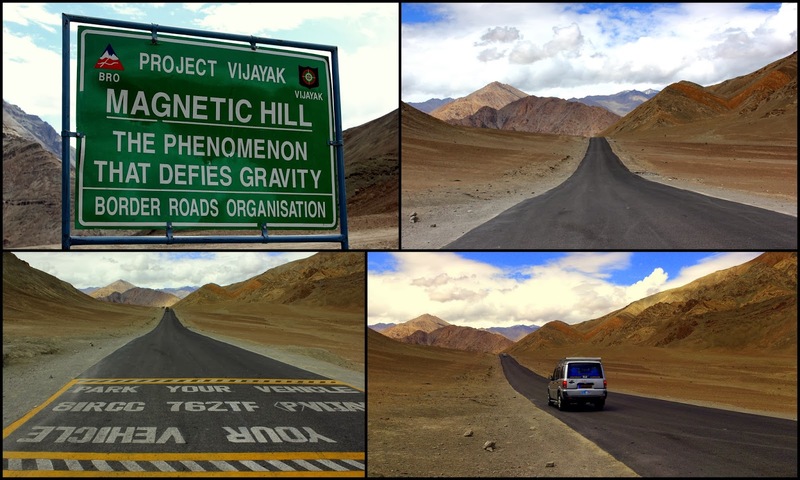 After spending almost 1 hour near magnetic hill, we started our return journey to Ladakh. The view of valleys and the high way was awesome. We reached leh by 4PM and asked driver to drop us at leh market. We did shopping for 2 hours and return to the hotel. When we reached hotel, our trip manager told us that the there was a huge land slide happened on the Leh to pangong lake road and probably can't be cleared till next evening. We were very upset after hearing that news and but still had a hope that we will reach pangong lake on the next day as per the plan. Next: Trip to Pangong Lake. If you stop your vehicles at a specific place, you can see that vehicles moving up at a speed of 20 km/ hour with the engines off. And it will impact aircraft and helicopters too. The slope of gravity hills is an optical illusion.The most important factor contributing to the illusion is a completely or mostly obstructed horizon; without a horizon, judging the slope of a surface is difficult as a reliable reference is missing. Objects one would normally assume to be more-or-less perpendicular to the ground (such as trees) may actually be leaning, offsetting the visual reference. 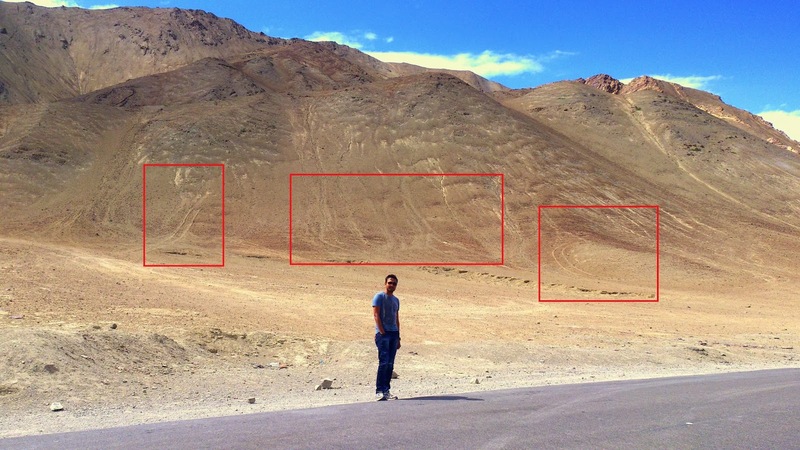 Probably this could be true, but there are tyre marks on the adjacent hills, which as per the locals are caused the same magnetic hill effect. If you put a 4*4 vehicle at the hill base, then the vehicle will move up hill with out starting the engine. This is really strange. Ladakh - The land of cool desert..
Great article and important for tourists which want travel to Ladakh.